Long beach days might be good for the soul, but they can also take a toll on your skin. 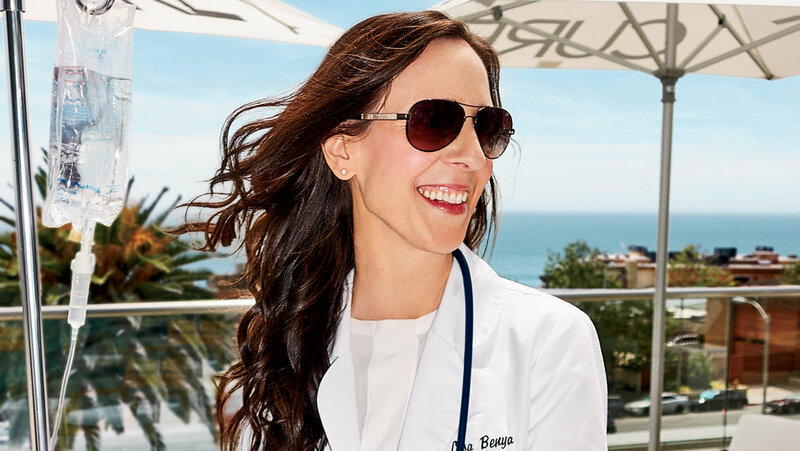 We turned to Dr. Lisa Benya, founder of CURE Salon & Spa, for some of her own secrets to help keep your face healthy and radiant all summer long. To brighten up your skin, exfoliating is key. Over time your body sheds dead skin cells and if they aren’t removed, they can lead to dull, dry and flaky skin. How often you should exfoliate this summer depends on how often you’re out in the sun. Removing the dead skin cells removes your skin’s protective layer, and as a result, it can increase your sun sensitivity and make you more prone to burn. “As the weather gets warmer, exfoliating once or twice a week should be enough to remove buildup,” Dr. Benya says. “I use a Gommage Exfoliating Gel by Sonage, it brightens and clarifies dull skin, eliminating dead surface skin, and leaving you with a healthy glow”. A good face polish or scrub can also unclog pores, helping your creams hydrate your skin more deeply. With this new layer of skin exposed, be sure to apply sunscreen daily. If you want to amp up your sun protection, Vitamin C can help maximize your skin’s protection when used in addition to your sunscreen. Dr. Benya recommends her medical-grade Vita-CE w/ Ferulic Acid Serum which can be found at Cure Spa, “Vitamin C reverses the signs of aging by increasing collagen production while providing super antioxidant protection,” Benya says. “It’s used to correct hyperpigmentation and reduce the appearance of fine lines and wrinkles.” Vitamin C helps neutralize free radicals that lead to premature signs of aging, and when used in the evening it can help fight post sun-damage as well. Drinking plenty of water is the easiest way to keep skin hydrated, but during the drying months of summer, a light nourishing moisturizer can help replenish your skin and lock in moisture without feeling too thick. A moisturizer with SPF is ideal during the day, rain or shine. Broad spectrum sunscreen is our best defense against the sun’s rays, even during the typical gloom of June. “I trade in foundation for a tinted sunscreen that is moisturizing and protecting,” Dr. Benya said. “My go-to is Skinmedic Total Defense and Repair, which absorbs quickly and also restores your skin.” Dr. Benya recommends using a sunscreen with an SPF of at least thirty, which blocks ninety-seven percent of the sun’s UVB rays. Don’t forget to reapply every two hours if you’re hitting the beach or the pool! To remove cellular damage and encourage healthy new rejuvenated skin, Dr. Benya suggests regular facials. “Once a month, I get a Detox Stem Cells Facial. It features the latest in skincare technology rejuvenating the skin in just one treatment using stem cells cultured from the Super Patagonia Maqui Berry. Fine lines, wrinkles, and pores are minimized and your skin is left brighter, hydrated, and perfected.” For deeper skin damage, Dr. Benya suggests IPL or Fractional Laser Resurfacing treatments to promote healthy skin renewal.